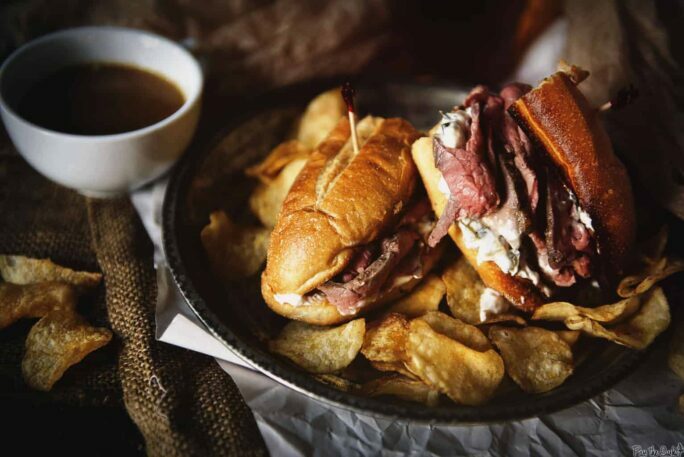 French dip sandwiches are the perfect food to kick off “Man Food Week”! These are the grab the napkins, roll up the sleeves and prepare your gullet for an experience it won’t soon forgive you for recipes. (Or at least the ones I could think of when I decided to have a ‘man food’ week here at Pass the Sushi). Get in on the action by posting your manly dishes on twitter with #manfoodweek – I’d love to see what everyone else deems manly. Now, as for today’s French Dip Sandwich recipe, I wish I could show you pictures of how this really went down. Normally, I cook, set up the area where I’ll snap some pictures while the food’s cooking, snap a few when it’s finished, and sit down to savor my dinner slowly. (This usually has a wrench thrown in it if Handsome isn’t at school late). That’s not quite how things went this time around. Oh, I cooked all day, wondering why in God’s name I decided to try this sandwich. I cursed myself for not thoroughly reading the directions ahead of time (which I am guilty of… a lot) to give myself the necessary time needed for this meal. Then I cursed myself for buying an eye round roast for a sandwich. More cursing myself, for spending more than 5 minutes in the kitchen to make a bloody sandwich. I convinced myself there was no sandwich in the world that was worth more then some leftovers salvaged on some bread with 5, maybe 10 minutes of prep work. Don’t get me wrong, but seriously, look at how long those directions are and tell me you wouldn’t think the same thing just once in the process. And so after mincing, marinating, simmering, roasting, straining, resting, toasting, slicing and dipping I set this French dip sandwich up for its glamour shot. That didn’t work out as planned. If I had taken a picture of what was on the plate by the time this was ready to shoot, you’d be seeing crumbs, some smeared au jus and maybe a stray onion that I hadn’t licked clean from the plate. That’s right, the French Dip Sandwich you see in these pictures is actually a member of the B team. It wasn’t even supposed to play today, but after I gorged myself on the first sandwich, making a sloppy mess of things, I figured I owed this one to you all so that you would know the 3+ hours of prep work is worth every second. 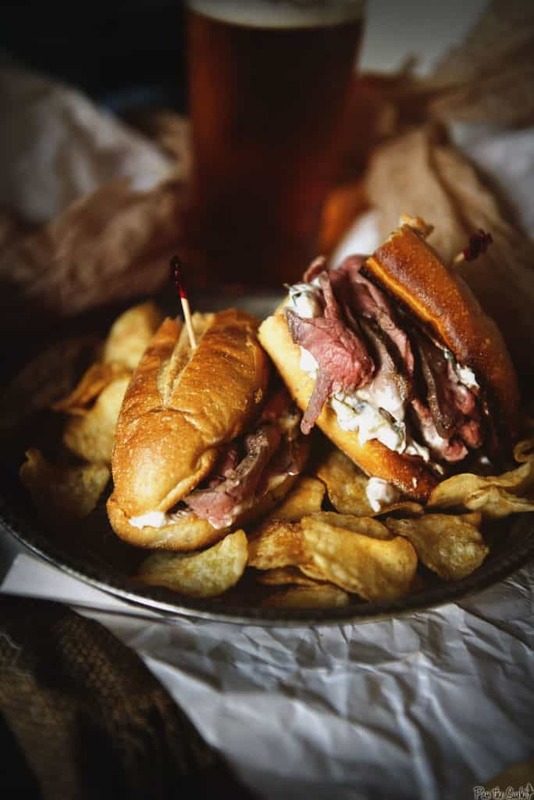 Here’s the recipe for the mighty manly French dip sandwiches. Heat the vegetable oil in a large skillet over medium-low heat. Add the onion and a pinch of salt; cover and cook, stirring until golden, about 35 minutes. Add the shallots and scallion whites; cover and cook, stirring, until browned about 25 more minutes. Stir in the scallion greens, then remove from heat and let cool. Chop the onion mixture and transfer to a bowl. Add the sour cream, mayo, vinegar, Worcestershire, and 1 teas salt. Cover and refrigerate at least 2 hours and up to 1 day. Mince the garlic, then sprinkle with 1 teas salt and mash into a paste with the flat side of a large knife. Transfer to a bowl; add the oil, celery salt, cayenne, and 1/2 teas black pepper. Cut small slits all over the beef with a knife, then use your fingers to push the garlic paste into the slits. Cover; refrigerate at least 1 hour to overnight. Preheat the oven to 425 degrees F. Bring the beef to room temperature. Sprinkle with 2 teas salt and 1/2 teas pepper. Place on a rack in a roasting pan; add 1 cup broth, water, the celery, onion and parsley to the pan. Roast 10 minutes, then reduce the oven temperature to 350 degrees F and roast until a thermometer inserted into the center of the beef registers 115 degrees F, about 45 minutes more. Transfer to a cutting board; let rest 20 minutes. Strain the pan juices, reserve. Melt the butter in a medium saucepan over medium heat. Add the flour and cook, stirring, 1 minute. Whisk in the reserved pan juices and the remaining 3 cups broth slowly and bring to a boil, whisking. Remove the pan from the heat and stir in the sherry. Assemble the sandwiches: Brush the rolls with some of the onion spread. Thinly slice the beef against the grain. Dunk the slices in the jus, then layer on the rolls. Serve with the remaining jus in small bowls for dipping. 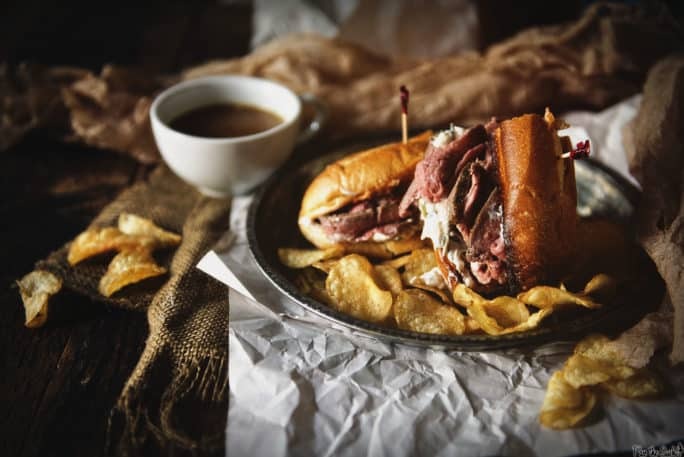 A note from a self-proclaimed experienced French dip sandwiches eater: Make sure you toast that bread. None of that cute barely golden just warm enough to smear butter on. 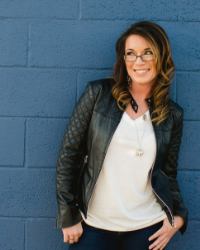 I’m talking live wild and toast it – heck, let the edges get a little black. The better the toasting, the less likely the bread is to crumble under the stress and pressure of all the dipping and enjoying you’ll be doing. I tried french dips for the first time this year- wowza! YUM! I so love french dips, and so do all of the fathers in my life. Your onion spread looks amazing too! Man Food Week – I LOVE it! It looks delicious and has me hungry already this morning – that onion spread sounds to die for! I love french dips they, are one of my all time favorite sandwiches. These sound amazing!!! Way to go on Man Week! Love it! I have had french dip sandwiches before but what really interests me about this recipe is the onion spread. That is what sets it apart from the standard sandwich. thanks so much for sharing this delicious recipe-buzz. Gorgeous pictures!! WOW Kita, those look outstanding! Oh, yeah, my hubby would be ALL over this sandwich…the rare roast beef is cooked to perfection! Hopefully the first one you made wasn’t burnt also. looks delicious, I love french dips! This is like the best series ever. Pure genius and absolutely ‘worth it.’ Really digging that onion spread. That looks good! It might be man food, but I sure like it!! This looks delicious! The French Dip is one of my favorite sandwiches. I had to laugh about the “man food” statement. I catch myself saying this quite a bit but I am with you. I typically pick the more “manly” option at most meals. Manly yes, but ladies like it too! I am making these next week!!! Oh how I love French Dip and your version looks amazing. Love the sherry in the jus – will def try that next time! I found this recipe on Pinterest – it’s out of this world!! Def a labor of love, but well worth it! The flavor alone on the meat is delicious! But my goodness, that onion spread! To die for! Thank you for giving it a go! This one is a TON of work… but yeah…. the flavors… Mmm!! !